Deep in Frosty Forest, past Bendy Brook and over High Hill, lives Barbar the Honey Beer. He’s a happy little beer who spends the warm summer days playing in the clearing with his friend Hoppy Hare and who sleeps away the long winters tucked up in his snug little den at Rough Rock. And his favourite food is, of course, honey, which this little beer can never seem to get quite enough of. Honestly, with a name like “Barbar the Honey Beer”, you’d expect a back story of something along these lines. However, Barbar comes not from Frosty Forest, but from the Lefèbvre Brewery in Quenast, Brabant, which also produces the not-so-fairytale -- though more enjoyable -- Floreffe. Barbar actually means barbarian and not anything cuddly at all. Though I suppose in days gone by, barbarian mothers found their barbarian babies cuddly. Isn’t “cuddly” a universal quality that spans all cultures, languages and eras? I submit to the team that it is. Sorry, where was I again? 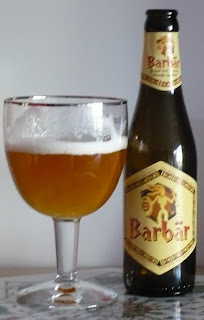 Yes, Barbar the Honey Beer. It’s another strong ale but with the gimmick of 2.5% honey added, which I guess provides part of the sugars for the secondary fermentation. Not a huge honey flavour in the actual beer, though. Some in the aftertaste, but it’s easy to miss. Oh, Barbar the Honey Beer, where is thy bee sting? That would be the 8% alcohol. The 40b40 clearly expected a bit more from Barbar. It’s been sitting on the shelf since day one staring at me, and I’d wanted it to be unique. Sadly, it wasn’t. It’s an above average strong ale. Not much more. One nifty feature, though: the label is in Braille. No other 40b40 beer had that. Westvleteren didn’t even have a label at all. Great beer! You should have the picture of the beer served in the correct glass!